"Understanding Franklin's soul is sort of understanding the soul of America." If you can, you should make it to the City of Brotherly Love some time soon�there's a party going on, because January 2006 marks the 300th anniversary of the birth of Philadelphia's favorite son, Benjamin Franklin. (Happy birthday, Ben!) It's a fair bet that the re-release on DVD of this documentary is pegged to that milestone, but whatever the date on the calendar, there's always something to be gained by revisiting the life of perhaps the first great American. 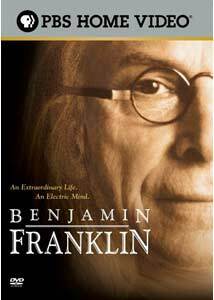 This thorough look at Franklin's life is a useful primer for the man and his times, both of which were extraordinary. This three-part documentary includes interviews with some of the foremost historians on colonial America�among them are Edmund Morgan, of Yale, and Gordon Wood, of Brown�a narration track read by Colm Feore, and actors decked out in full eighteenth-century trimmings, reading from the writings of the relevant historical figures. I'm not a big fan of historical re-creations in documentaries�they tend either to be misleading or to look like awful Independence Day parade tableaux�but the filmmakers wisely chose to have the actors speak only to the camera, and not to one another. You can appreciate their predicament�there are only so many times, over the course of more than three hours, that you'll want to dolly in on or out from the limited number of contemporary portraits of Franklin. Dylan Baker reads the words of Franklin as a younger man, though Richard Easton, as the iconic Franklin, gets much more screen time. There are also mute re-creations of period street scenes, which add to the visual interest. Part One, Let The Experiment Be Made, takes us through better than half of Franklin's 84 years. Born in 1706 in Boston, Franklin was a boy of prodigious intelligence from a family of modest means. He was apprenticed to his brother James, a printer, though Ben chafed at the restraints of his position, and soon ran away�first to London for a spell, and then to the city he would take up as his home, Philadelphia. Franklin was born just fifteen years after the Salem witch trials, and he more than anyone brought about an age of enlightenment in the colonies�it was his invention of a lightning rod, for instance, that dispelled the popular belief that homes struck and burned down by lightning were evidence of God's punishment. We see Ben establish his own print shop, and begin publishing his wildly popular Poor Richard's Almanac; taking the lovely Deborah as his wife; and unlocking the mysteries of electricity, not only with the famous kite and key, but also by electrifying a turkey. His insistence on what we would recognize as modern scientific method�hypothesis, experimentation, re-evaluation�distinguished him from the slipshod, would-be scientists of his time. Part Two documents The Making of a Revolutionary�now a celebrity, Franklin discovers the fringe benefit of attention from young women. (It's never clearly established if Franklin was a womanizer, or merely a flirt.) He was dispatched to London, and among his friends were the brightest minds of the time, including James Watt and David Hume; his son William became, through his father's influence, the royal governor of New Jersey. Franklin takes the lead in getting the Stamp Act repealed, and in doing so becomes the de facto spokesman for the upstart colonies. Part Three, The Chess Master, focuses on Franklin's years in Paris. Shortly after the American Revolution began, Franklin was dispatched as the new country's emissary to France, his mission to get support, both military and financial, for the war. His critics charged that he took too much to the pleasures of the pre-revolutionary French aristocracy; John Adams was particularly withering in his criticism, but it was Franklin who was successful in enlisting aid from the French. His last mission in Europe was to participate in the negotiation of the Treaty of Paris, ensuring American independence�he then returned home a hero, and became the only Founding Father to take up the cause of abolition. In his last years, he was the wise old man of the Constitutional Convention, and died peacefully, ancient for his time, beloved by all. The whole project is informed with a deep affection for Franklin, and even if it's been a while since you've taken American history, this is a fine way to pay your respects. Image Transfer Review: Well transferred, with only a modest amount of scratching. Audio Transfer Review: Adequately transferred, with a few instances of buzzing. Extras Review: A making-of featurette (03m:53s) focuses on the film crew's location shooting in Lithuania, their best available option for eighteenth-century urban exteriors. The seven deleted scenes (10m:23s in all) are additional snippets of Easton reading from Franklin's writing�the most notable is Franklin's famous dictum on the inevitability of death and taxes. Resolutely American and, in the best sense, a Renaissance man, Franklin is treated with the respect and affection he earned in his lifetime, and down through the centuries. Besides, he's a far better ambassador for his hometown than Terrell Owens, even if Ben never answered the most crucial question for a Philadelphian: Cheez Whiz, or provolone?